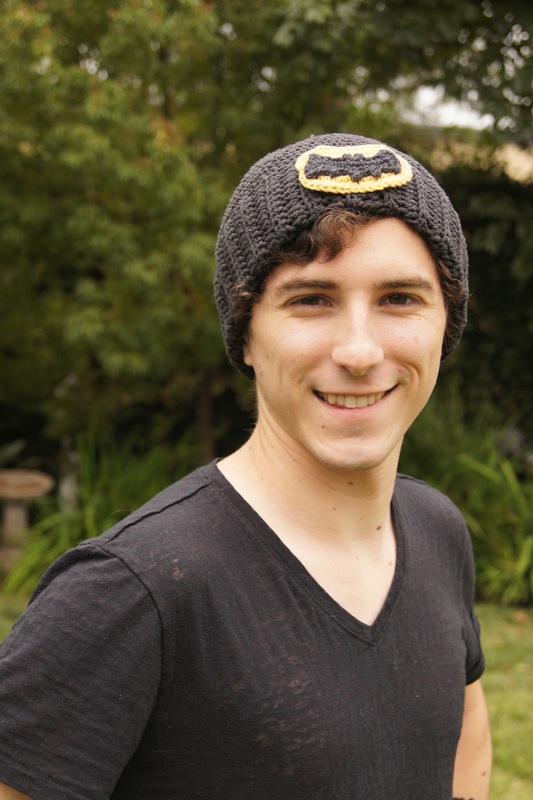 This Friday yet another awesome superhero movie of this summer comes out, The Dark Knight Rises, and you know I'm here to make an equally awesome pattern to commemorate it! Iron man's not the only one with some sweet gloves, and do to the popularity of my Iron Man Fingerless Mittens posted last month, I decided to make some Batman Ninja versions of them! And don't forget to check out the Batman Ninja Fingerless Mittens out on Ravelry here! Thanks!! I'm glad you like them :) Hopefully I'll be doing this for a long time coming! Wow! Uncalled for Sue!! Shame on you! At your age, hopefully you would have learned manners, & the expression "if you don't have anything nice to say, don't say anything at all! And if you were having issues, your 35 years of experience should have helped you figure it out! Louis, I have been crocheting for since I was 8, & this pattern was awesome! 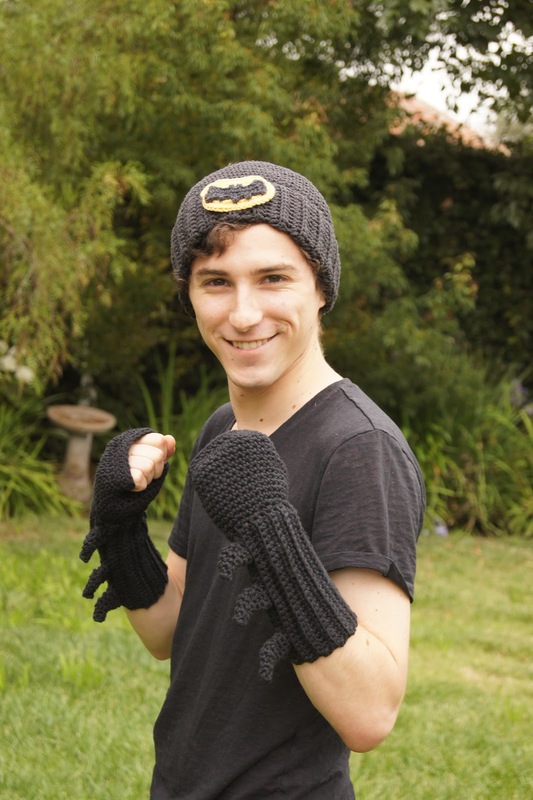 My boys love all of the cool stuff we have whipped up--mustaches, iron man gloves & batman hats! Keep up the good work my dear! Sue, please rephrase your comment so that it doesn't sound so critical. Be appreciative of the work designers do rather than critical of the way they write out a pattern. I for one love the pattern and my youngest granddaughter asked me just today for a Batman earflap hat so guess what I'll be hooking...yep! Louis, thank you so much. As soon as my brain figures out what m.p. is I'll be all set. Hey Kelly! So I do have a pattern for the oval, I just haven't posted it yet. I'll post it as a new pattern for you this week! I needed to post a new pattern anyhow haha, so this will be perfect! If you want it sooner (like nowish) send me an email to louies.loops@gmail.com and I'll send it to you! So I think I know what's going on. I think you're counting the m.p (mini picots) as a separate stitch and putting them in the foundation chs. For the m.ps you should be chaining 2 directly after the last st and sl.sting into the back loop of the first ch made, not in the foundation round though. If you count without those stitches you should get 14 (not including the final sl.st). I made a slight correction in the pattern to account for the 2 chs in the beginning that you skip to start (a little typo that I've never noticed until now, thanks!). I hope this helps. If you'd like to, email me at louies.loops@gmail.com and maybe we can figure out what's going on in greater detail. 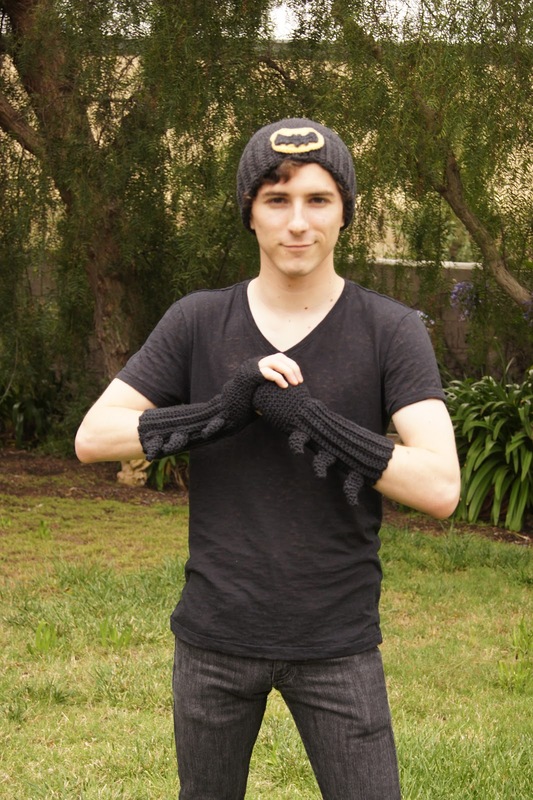 Hi, I have a question on your batman cuffs. When I get to Rnd 3-23 I am confused. It says to pull loop through first ch made - ? what chain are you talking about? The it says to sc 1 in bk st, pull loop through next ch and continue what does that mean. Did I pull the yarn all the way through the first sc, and I am starting another? Please explain what you mean, and was I suppose to connect any of these? Please help. Thanks. Sorry for the confusion. Basically, you pull through the very first ch made in the base chs before Rnd 1. You're basically seeming the cuff together here by pulling the loop through each ch made in the base and sc along the back sts in Rnd 23 as you go. Does that help? If you need more help email me at louies.loops@gmail.com and we can figure it out. Hi Louis, Thanks for getting back to me. Only that doesn't help, you are telling me how to connect it when I get to round 23 and I am trying to do round 3 - 24, but that is okay, I just made it all sc and it doesn't look bad. I did email you too, but I didn't get a response. I figured you must be busy or something. I am glad that you are well thank you for getting back to me. If I get confused about anything else I will try emailing you again or I will leave a message here. 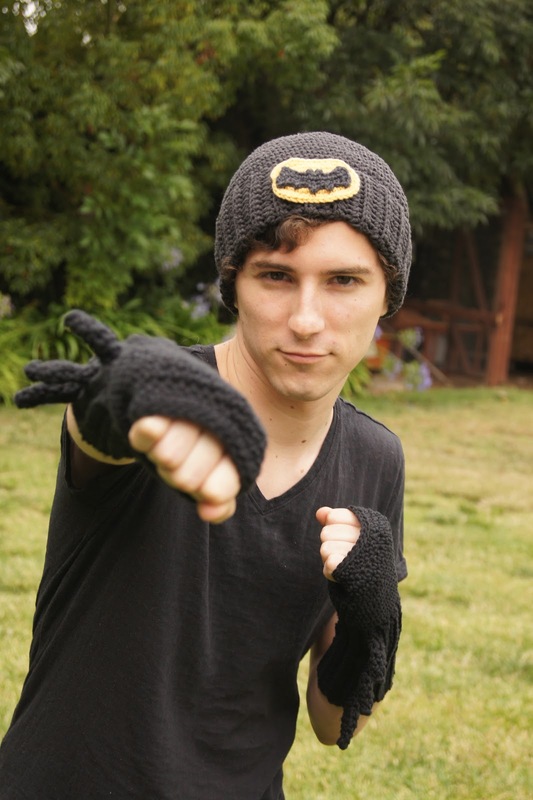 hey i know you may have answered this question...but for your batman gloves...im a bit confused am I suppose to crochet 2 cuffs and sew them together? :( and then start on the gloves part? Thank you!! !